Proprietors with micro-cultivation licenses in Canada won’t be able to circumvent the canopy limit by growing cannabis on vertically arranged spaces. 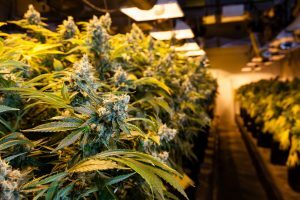 The proposed limit of 200 square meters for micro-cultivation licensees would be based on the surface area occupied by all of the parts of cannabis plants, not just the floor space of the area in which the plants are grown. “Therefore, under the proposed approach, if plants are arranged on multiple surfaces in a given area – such as on shelves vertically arranged one on top of each other – the area occupied by the plants on each shelf would need to be included in the calculation of total canopy area,” Health Canada confirmed to Marijuana Business Daily in an emailed statement. No such canopy limit exists for current licensed producers of cannabis. The proposed new micro-cultivation and micro-processing licenses are separate from the marijuana legalization bill currently before the Senate. Health Canada also confirmed the rules as part of a memo circulated among industry sources, according to Deepak Anand, vice president of government relations for the consultancy Cannabis Compliance. Anand has seen significant interest from gray-market growers in micro-cultivation licenses. “I think (the 200-square-meter canopy limit) is more than enough to make a profit. If you truly want to run a craft, then this is a good way to do it,” Anand said. The industry group represents over 100 current cannabis-related businesses.